Getting to Stellenbosch: The nearest commercial airport is Cape Town International Airport, which is serviced by all domestic airlines and several major international carriers. Cape Town International Airport is 35km from Stellenbosch. A number of shuttle services operate between the Airport and Stellenbosch, including Citi Hopper, which has a travel desk at the Airport. Uber and metered taxi services are also available. There is no public transport service between the Airport and Stellenbosch. If you will be travelling with minors, please take note of the requirements by South African Immigration. You will not be allowed to enter South Africa without an unabridged birth certificate for minors. For visa regulations and requirements, please consult the SA Dept of Home Affairs website. Accommodation: Stellenbosch is a major tourist destination, with a wide variety of accommodation options available both in town and in neighbouring areas. Accommodation ranges from low cost backpackers to high end boutique hotels and guesthouses. A list of accommodation options is available from the Stellenbosch Visitor Information Centre. Note that this includes accommodation that is significantly further afield, and several wine farm options. Alternatively, you can consult well-known booking sites such as Booking.com or Airbnb.com. Travelling in comfort costs about €140 (R2,000) per day for accommodation and subsistence. Travelling on a shoestring is possible for about €70 (R1,000) per day. 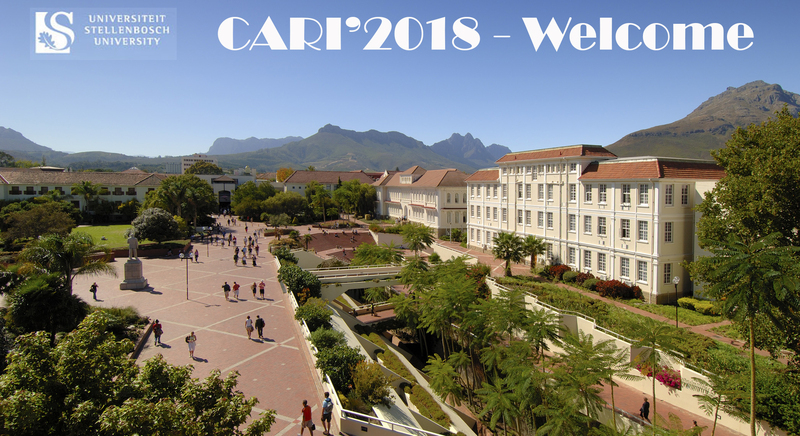 Venue: CARI 2018 will be held at the Wallenberg Research Centre, Stellenbosch Institute for Advanced Study, 10 Marais street, Stellenbosch. STIAS is within easy walking distance from the the historical town centre, adjacent to the Jan Marais Nature Reserve.